True love includes a sense of responsibility and accepting the other person as she is, with all her strengths and weaknesses. If you only like the best things in a person, that is not love. You have to accept her weaknesses and bring your patience, understanding, and energy to help her transform. Other people’s actions are the result of their own pain and not the result of any intention to hurt you. A wrong perception can be the cause of a lot of suffering. This is why, whenever we have a perception, we have to ask ourselves if our perception is right. One way we nourish our love is by being conscious of what we consume. Many of us think of our daily nourishment only in terms of what we eat. But in fact, there are four kinds of food that we consume every day. They are: edible food (what we put in our mouths to nourish our bodies), sensory food (what we smell, hear, taste, feel, and touch), volition (the motivation and intention that fuels us), and consciousness (this includes our individual consciousness, the collective consciousness, and our environment). Our individual consciousness is influenced by the collective consciousness of our environment. We absorb and reflect what is around us. The notions and ideas we have about happiness can entrap us. We forget that they are just notions and ideas. Our idea of happiness may be the very thing that’s preventing us from being happy. When we’re caught in a belief that happiness should take a particular form, we fail to see the opportunities for joy that are right in front of us. Live in a way that encourages deep happiness in yourself and others. You can vow to bring joy to one person in the morning and to help relieve the suffering of one person in the afternoon. Ask yourself, “Who can I make smile this morning?” This is the art of creating happiness. Reverence is the nature of our love. The moment love stops growing, it begins to die. When we learn to love and understand ourselves and have true compassion for ourselves, then we can truly love and understand another person. Compassion is the capacity to understand the suffering in oneself and in the other person. If you understand your own suffering, you can help him to understand his suffering. Understanding suffering brings compassion and relief. When you know how to generate joy, it nourishes you and nourishes the other person. What happens to your loved one happens to you. What happens to you happens to your loved one. If you can accept your body, then you have a chance to see your body as your home. You can rest in your body, settle in, relax, and feel joy and ease. In true love, there’s no more separation or discrimination. His happiness is your happiness. Your suffering is his suffering. In true love there is no place for pride. We have to look deeply at our body, feelings, perceptions, mental formations, and consciousness. We can observe how much peace, happiness, and lightness we already have. We can notice whether we are anxious about accidents or misfortunes, and how much anger, irritation, fear, anxiety, or worry are still in us. As we become aware of the feelings in us, our self-understanding will deepen. We will see how our fears and lack of peace contribute to our unhappiness, and we will see the value of loving ourselves and cultivating a heart of compassion. Love will enter our thoughts, words, and actions. Your good intentions are not enough; you have to be artful. One of the greatest gifts we can offer people is to embody nonattachment and nonfear. Practicing to realize nondiscrimination, to see the interconnectedness and impermanence of all things, and to share this wisdom with others, we are giving the gift of nonfear. Everything is impermanent. This moment passes. That person walks away. Happiness is still possible. The most precious inheritance that parents can give their children is their own happiness. If we have happy parents, we have received the richest inheritance of all. I am here for you – The greatest gift we can make to others is our true presence. This is a happy moment – when you’re sitting together, walking together, eating, or doing something together, breathe in mindfully and realize how lucky you are. Mindfulness makes the present moment into a wonderful moment. In the practice of compassionate listening, you listen with only one purpose: to give the other person a chance to speak out and suffer less. Hugging is a deep practice; you need to be totally present to do it correctly. When I drink a glass of water, I invest one hundred percent of myself in drinking it. You can train yourself to live every moment of your daily life like that. We are aware that blaming and arguing can never help us and only create a wider gap between us; that only understanding, trust, and love can help us change and grow. 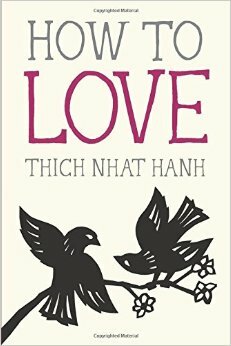 This entry was posted in Books and tagged Love, Relationships, Spiritual, Thich Nhat Hanh on June 2, 2015 by Blas.